Before I am off to bed, I just want to say Happy Birthday again to my Mom. I hope you had a great day…I am so extremely blessed to have you as my mother. Okay, so I spent way too much time looking for the pictures of my 10 year High School Reunion; only to realize that my Mom has them. 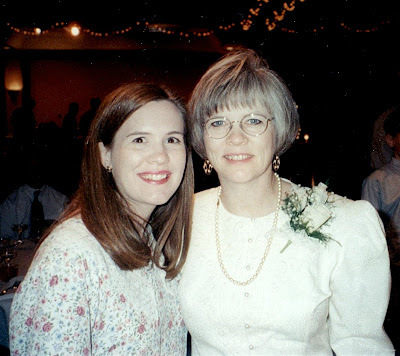 Well, I found this picture of my Mom & I at my step-brother’s wedding which was very close to the time the reunion was held. So this is what I looked like in September of 1998. My next post will show you pictures of what I looked like my Senior year of high school…1988. There is a huge difference! That doesn’t surprise me, though. I love to have different hair styles, if you know me, you KNOW that to be true! By the way, I was 8 and a half months pregnant with my second child at the time. Now, ten years later since this picture was taken, about the only difference besides the hair would be the dreaded wrinkles! Ugh!!!! I guess we have to age sometime! This weekend I will be traveling back to my “home town” to celebrate 20 years since High School graduation…Class of ’88. WOW! Doesn’t that make me feel old! I have been out of school now longer than I was in school! I enjoyed going to my 10 year high school reunion; even though I was 8 months pregnant with my son. I was huge! I will have to search for the pictures and post them here. That will be a good laugh! I am excited to see everyone again. Happy Birthday to my oldest child today. I thank my Heavenly Father for blessing me with you. We had a great day! We were able to go to the photography studio today and had a family portrait as well as some individuals made of each of us. It was the smoothest photo shoot yet with the kids. I can’t wait to see the proofs tomorrow. My 20 year HS reunion is fast approaching. I can’t believe how the time has gone by. So many milestones right now. I am grateful to be here to experience them. Each day is a gift…we don’t know when our time on this earth will be done. If we truly think about this every day – how can we take it for granted? It is because we are human.